EXPERT REACTION: 10 years on from Black Saturday - what have we learnt? The devastating Black Saturday bushfires occurred ten years ago this Thursday on Saturday February 7, 2009. Australian experts reflect on what we have learnt in the last ten years. These comments have been collated by the Science Media Centre to provide a variety of expert perspectives on this issue. Feel free to use these quotes in your stories. Views expressed are the personal opinions of the experts named. They do not represent the views of the SMC or any other organisation unless specifically stated. Professor David Bowman is Professor of Pyrogeography and Fire Science at The University of Tasmania. I think that both the 1967 Black Tuesday fire in Hobart and the 2009 Black Saturday fires occur on 7 February needs to be recognised. We are in the peak of fire danger in southern Australia. Fires are burning in Tasmania and Victoria. Fire seasons and become longer and have more extreme fire weather so the peak of the fire season is a particularly dangerous time. Climate change is loading the dice for a repeat of these catastrophic fires. Most people are unaware of the mounting danger of living in dangerously flammable bushland in a period of climate change. Australia’s temperate forests are among the most fire-prone in the world. A few weeks of warm, dry weather conditions is all it takes to prime eucalypt forest landscapes for widespread fire. Projected changes in the frequency and intensity of extreme climate and weather events could profoundly affect the flammability dynamics of forests in Australia. Effective management of the forest fire hazard and emissions requires accurate, timely and preferably spatially continuous, information about the moisture content of all forest fuel components. “We still have much to do, but we have already come a long way in using satellite data to tell us the risk of catastrophic fires from day to day”. For example, the Australian Flammability Monitoring System is a new interactive map providing better information that helps fire managers undertake prescribed burns safer and assess the risk of bushfires occurring. Thanks to the information currently provided by satellites we can now retrospectively see that the cumulative eﬀect of successive years of below-average rainfall before 2009 increased dryness and flammability of live vegetation throughout south-east Australia and suggested the occurrence of higher ﬁre risk conditions the weeks prior the Black Saturday fires. January 2019 was Australia’s hottest ever and we are watching Tasmania burn. Such events and the Black Saturday bushfires are, sadly, likely to repeat themselves with increasingly frequency. Once in a generation natural disasters are becoming regular. As climate extremes like heatwaves and drought become more frequent and extreme we can expect bushfires to increase and interact creating more dangerous and long-last lasting impacts across Australia. Forests and animal populations may take much longer to recover. The challenge now is to accept that we cannot manage our way out of the problem and rather to mitigate risk to human safety and biodiversity conservation. Many of the Black Saturday bushfires were from power line failures; these are risks that can be addressed as can building codes and evacuation procedures. People ask me as an ecologist, how is the forest recovering after the devastating fires? What we’ve learnt is the answer depends on what particular type of forest we’re talking about. Some ancient Mountain Ash forests that were killed on the day our now dense thickets of young saplings – 10 years along a 3-500 year journey (see picture 5 years after fire). So in that forest type, the question is very open as to whether under climate change (with more frequent, severe fires) it will ever get a chance to return to its former glory. For Alpine Ash forests, adult trees are also killed by fire and regeneration is reliant on seed being shed after the fire passes. But too frequent fires in these forests have prevented saplings having sufficient time between fires to set seed, so large areas of this forest type (and all the animals that depend on it) have been wiped out. Managers are now having to re-seed vast tracts of land, but finding sufficient seed can be challenging. Our Foothill Forests of stringybark and peppermint eucalypts resprout spectacularly after fire, and can provide startling examples of recovery after fire. But even these hardy forests can be pushed beyond their limits if severe fires are too frequent and the eucalypts exhaust their internal energy stores. Adult trees succumb to too many fires, can’t produce seed fast enough and are replaced by fire loving wattles for decades or possible centuries to come. So our forests need time to recover from severe bushfires-substantial periods of time. Our challenge as stewards of these precious forests is to give them every opportunity to do that. 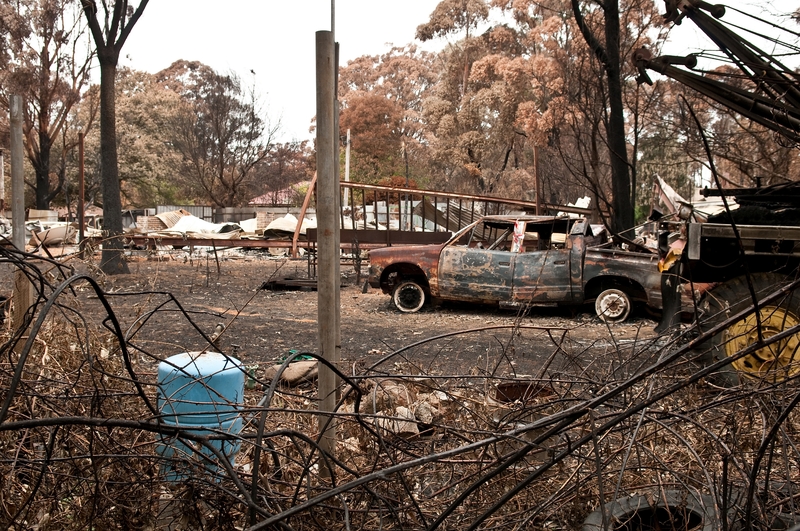 The Black Saturday Bushfires sparked generational disaster management reform in Australia. Change included an acknowledgement of the importance of public warnings in empowering community responses to disasters and the adoption of a national bushfire warnings framework. Investment occurred in the national emergency alert telephone based warning system to enhance the delivery of emergency warnings and agencies adopted social media as a means of spreading the word. Bushfire safety policy was reviewed with a greater focus on the provision of a range of shelter options and on encouraging communities to leave early on high risk days as the safest course of action. It is inevitable that the conditions that resulted in the Black Saturday tragedy will occur again and systems will be tested under significant stress. Climate projections show an increased frequency of future bushfire weather associated with climate change and populations continue to increase in at-risk areas. In the face of such challenges governments alone cannot hold full accountability for the management of emergency risks, communities must too take responsibility for their preparedness. · Close friends and family, social networks and community groups were important influences on resilience and recovery. · People living alone were at higher risk of poor mental health outcomes but this risk was reduced for people who belonged to local community groups. · In communities in which many people belonged to local groups, the benefits extended to other people living in that community. This shows that community group membership is a key factor in establishing and maintaining healthy and resilient communities. · Strong attachment to the natural environment was also associated with increased mental health, life satisfaction, resilience, community attachment & posttraumatic growth. · People who relocated out of affected communities had similar levels of wellbeing 3-5 years afterwards compared to those that stayed, but showed different support service needs. · Further analyses using NAPLAN data showed reduced progress in children’s reading and maths 4 years after the fires. The University of Melbourne will be recontacting the Beyond Bushfires research participants in 2019 for the 10 years Beyond Bushfires study to learn about long term experiences after a disaster. It is very challenging to prepare for extreme events. Since Black Saturday, researchers at the Centre for Disaster Management and Public Safety have developed an analysis tool that can visualise volunteer firefighting capacity across Victoria. It analyses past fire and emergency surge capacity responses from 1999 – 2015. Our system shows that there were over 400 ongoing incidents (the surge) on Black Saturday across Victoria – this number is three times the average of the concurrent incident that CFA usually handled in their busy seasons (from January to March). The number dropped to 150 three days later and fluctuated around at that number till the end of February. Our analysis also shows that over 2000 fire trucks were deployed on Black Saturday, which is six times of the average number (367) of concurrent fire truck deployment in the normal busy seasons. From a resource supply perspective, this information can help identify priority needs for workforce planning capability and optimise emergency resource allocation. What have we learnt from the Black Saturday bushfires? What we learned most from Black Saturday is the need to distinguish ‘normal’ bushfires (dangerous as these are) from extreme bushfires like that on Black Saturday—when following a period of drought, a fire breaks out in bushland (grass, scrub, forest) on a day of 40 degree-plus temperatures, with relative humidity 10 percent or lower, and winds of more than 60 kilometres an hour and gusting higher. A day of Catastrophic or Code Red fire danger. If households are in the path of such a fire there is potential for a disaster. Efforts by authorities to suppress or contain such intense fires are unlikely to be effective. A householder’s attempt to defend even a well-prepared home will be a hazardous gamble—too many things can go wrong, such as a pump engine failing due to the heat, part of the roof being blown off, or a wind-blown tree branch smashing a window. The extreme heat will leave little chance of surviving. Preparing to evacuate early, knowing where you will go and how you will get there safely, plus checking continually for news or signs of a fire threat, will be the only safe plan for most people. Are we much better prepared to face such a catastrophe now? That depends on who ‘we’ are. Police, fire and emergency services and agencies like the Bureau of Meteorology are much better prepared to manage a Black Saturday type extreme bushfire event. Fire behaviour prediction has improved greatly, as has the technology for issuing warnings. Authorities are now highly experienced in the use of aircraft to drop retardant or water to slow a fire and help protect life and property. But, sadly, a decade of post-Black Saturday research in communities by the Bushfire Cooperative Research Centre and the Bushfire and Natural Hazards CRC, and by fire agencies, indicates only modest levels of improvement, overall, in householder awareness of their danger and preparations to survive in the event of a serious bushfire threat. A belief that ‘bushfires happen elsewhere to other households, on TV’ remains widespread. Dr Richard Thornton is CEO of the Bushfire and Natural Hazards Cooperative Research Centre. Black Saturday was a tragic day for many, and is now viewed as a defining moment in the way such emergencies are handled, not just in Australia, but around the world. The changes have been comprehensive – in policy, operations, community engagement, and in the way we have invested in learning from adversity. Community information and warnings are now significantly different in both content and tone to ensure that they are heard, based on our research identifying many people under threat of fire – either actual or potential – who process that information in unexpected ways. Fire agencies across the country have learnt from this and have adopted stronger and more specific community messaging, which has undoubtedly resulted in a reduction in loss of life and property in subsequent bushfires. This is a long and difficult ongoing task, and the role of research is not just to identify the limitations of current warnings and emergency information, but to help construct a new language that has impact. The extensive investment in science has led to a better understanding of the fire behaviour that occurred on that day – how fire moves across different types of land and vegetation, and how fire interacts with the atmosphere to create its own weather. These new insights are now embedded in training packages for fire behaviour analysts to provide more accurate warnings to the community. We now have fire simulation tools used routinely in incident control rooms throughout the country. Yet even with all these major changes, days like 7 February 2009 are possible again: it wasn’t unprecedented then and we will see weather conditions like that again. Climate change is changing the frequency and severity of this weather. We know that on the really bad days like Black Saturday, our fire agencies will not stop these fires any more than they can stop a cyclone or volcano. What we can do is ensure that communities, businesses and governments are more resilient to the impacts of these disasters. It is clear we still need to invest more in mitigation. We need to be investing in the reduction of the hazardous vegetation in regional areas as well as on the urban fringe, especially around the places we live and work, in training and resourcing our agencies, and importantly in further research to provide the ongoing evidence for the development of policies and practices to deal with the increasingly hotter and drier climate. There is still a lot of work to do in understanding how communities understand and interpret their risk, and how that perception can be changed. Media contact details for this story are only visible to registered journalists.